SO YOU THINK (NZ) (Bay or Brown 2006-Stud 2012). Champion 3YO Colt in Australia in 2009-10. Champion Miler in Australia in 2010-11. Champion Older Horse in Ireland in 2011 & 2012 (Int.). 14 wins-1 at 2-from 1400m to 2100m, MVRC WS Cox P., Gr.1-twice, Leopardstown Irish Champion S., Gr.1, Royal Ascot Prince of Wales's S., Gr.1, Sandown Eclipse S., Gr.1. Half-brother to SP Now You Know. Sire of the placegetters Gold Rush, etc. His oldest progeny are 2YOs. Ab Fav Di (f. by Falvelon). Winner at 2 in Aust. Dantibes Rhythm. 5 wins. See above. Sadler's Rhythm. 3 wins to 1400m in Aust. Glace Star (Famous Star). 4 wins-2 at 2-from 800m to 2100m, ARC Sunday Star-Times H., Avondale JC Ra Ora Juvenile S., 2d ARC State Insurance H., Avondale JC Cabella Construction S., Counties RC Pukekohe Ford Juvenile S., 3d ARC Eclipse S., Gr.3, New Zealand Derby Trial S., L.
Feel the Rhythm. 6 wins. See above. Fungold. 6 wins to 1400m, BATC Manikato H., 2d BATC Chef Bordeau Gadget S., QTC Pumicestone H., 3d BATC Gloria Marshall S., Princess Reichen H.
Go Commando. 5 wins from 1500m to 2000m, VRC Think Big H., MVRC Carlton Draught H., 3d MRC Galway H.
Prissy. 4 wins from 1000m to 1650m, BTC Hotel Conrad H., 2d BTC Coca-Cola H., Doomben H., Qantas China H., 3d BTC QBBS Bargains H. Producer. Boska Breeze. 14 wins to 1300m in Aust. Jolly Bacon. 10 wins-1 at 2-to 1400m, 2d BATC Orlando Wines H., 3d BATC Carrington Blush H.
Costa D'Ora. 6 wins to 1200m in Aust. El Commodore. 5 wins from 1000m to 1650m in Aust. Megamix. 4 wins from 1300m to 1800m, 2d BATC K Walters/G Lazarus H., Daydawn H., QTC Lowan Star H. Producer. Jolly Wonder. 2 wins at 1400m in Aust. Groovy Lady. Winner at 1800m, 3d BTC Couran Cove Island Resort H.
Zahnoochi. 2 wins at 1400m, 1800m, 2d BRC AAMI H.
Mrs. Morty. 4 wins to 1500m, QTC Lowan Star H.
Sweet Bye (Bye Bye). 7 wins-1 at 2-from 1200m to 2200m, BATC Open H., QTC Bert Hinkler H., Qld Tatt's RC 2YO H., QTC Novice H., Encourage H., 3d STC Frederick Clissold H., L.
Bename. 13 wins from 1100m to 2150m, QTC Brothers Rugby H., 2d QTC Gregory Terrace Cup. Patches (Call Report). 10 wins to 1550m, A$83,200, BATC Dairy Cows H., QTC Affectionate H., Imposera H., 2d BATC Gunsynd Flying H., QTC Longchamp H., 3d BATC Doomben S., L, Asthma Foundation H., A Langer & W Bennett H., Cig Balloon Gas Flying H., Catholic Womens League Welter H.
God's Prospect (Godswalk). 3 wins at 2, A$390,900, BATC QBBS Doomben Breeders Classic, Orlando H., 2d BATC Weekend H., QTC John Cant Hyundai H., 3d BATC Golden S., L, Marycrest Lilian H. Producer. LA VIE AMOUR (Show a Heart). 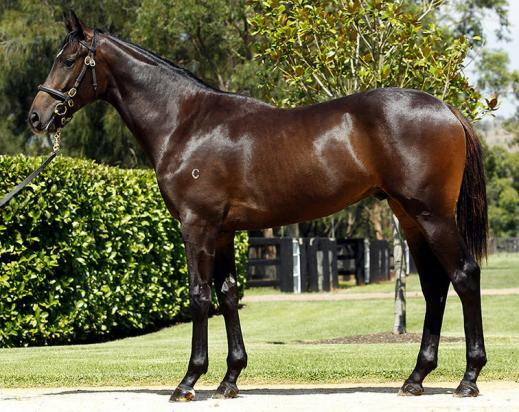 3 wins-1 at 2-at 1000m, 1100m, A$111,250, MRC Quezette S., L, Bell Potter Securities H., VRC Hobson' Bay 2YO H.